Hey there Freelancers! I wanted to write a quick review about an E-book I read a while back. I was just getting into essential oils and it was a daunting task to say the least. Where do I start? Which oils do I buy? How much do I use? What’s the point of all this? Plus many more questions were racing through my brain wondering if I should shell out the dough. 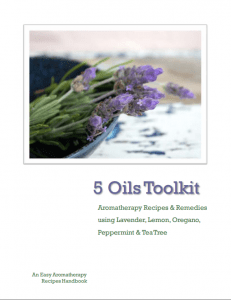 So, I went searching and stumbled upon a book written by Kyley Zimmerman, 5 Oils Toolkit – Aromatherapy recipes & remedies using Lavender, Lemon, Oregano, Peppermint and TeaTree. 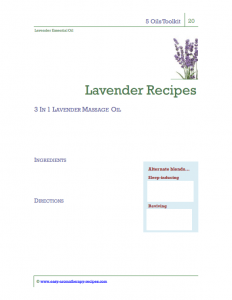 As I was looking for easy aromatherapy recipes and this sounded like a great place to start. If you’ve looked into essential oils at all, you’ll know that the options are endless and it can be more than a bit overwhelming. When I happened upon Kyleey’s 5 Oils Toolkit, I thought, “5 oils? I can handle that.” The organization and the way she lays everything out couldn’t have been better for the novice that I was. Chapters 1 and 2 focus on an overview of essential oils and how exactly you should be using them for maximum effectiveness. 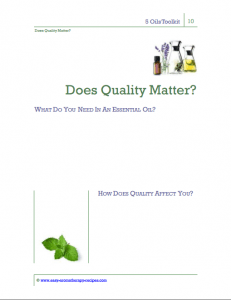 She breaks down what they are, what they do, why quality is important and the safety and application of using essential oils. Looking back, these are all things I should’ve known about essential oils before even thinking about buying. Having her lay everything out in such as easy and well-spaced way made a fairly difficult subject easy to digest. Plus, she saved me from the 100’s of things I probably would have done wrong without her book. 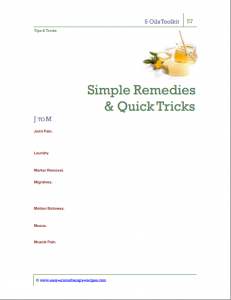 She then lays out over 60 common ailments, such as bad breath or sunburn and exactly how to cure them using one or a blend of the 5 oils she already talked about. They’re organized alphabetically, and they’re very easy aromatherapy recipes that anyone could handle. Lastly, she then talks about her favorite brand of essential oils, why she likes that particular brand and then some resources to help you continue your journey through the world of essential oils. Honestly, if you’re a newbie to essential oils, aren’t sure where to start and are somewhat overwhelmed with all of the contradicting information out there, this book, in my opinion, is a perfect first stepping stone. Beginning with 5. more or less familiar, essential oils, understanding exactly what they can do and what you should expect will get you headed in the right direction. However, if you have some knowledge and don’t need to start from zero, then it may be a bit basic for you. She’s undeniably knowledgeable about essential oils and even says that she’s been able to work strictly from home with her understanding of essential oils. Her recipes and guidance definitely launched my interest in essential oils and at least I knew I was headed in the right direction. Click here to head to her website to see for yourself. I just started dabbling in the world of essential oils and I’m pretty lost right now, to say the least. I found some interesting stuff on a few websites, including Dr. Axe. But you certainly know how easily someone can get overwhelmed with information in the Internet age. The “5 Oils Toolkit” looks like a good place to start. Unfortunately, it is only available in digital format. You could always read it on your computer/whichever device you’re using to write the comment. It’s les than 70 pages with a lot of great bulleted, well-organized info. I get it that it’s not the most comfortable format thought. Anywho, thanks for taking a look and best of luck. If you have any questions please don’t hesitate to ask! I actually have bad breath and really want to get rid of it. I really like what this book covers and I think that it can come in hand in future. You said that anyone can handle the recipes but I am a complete newbie. How long will it take me to prepare these? This book would be perfect for you. Many of the recipes are counted in drops and a lot of the tops come with drops or droppers. So it should take you about as long as it take you to count out 5-10 drops and put them in an empty bottle. There are also some recipes where you mix them with different oils to dilute them. Each recipe will take you less than 1 minute if you have the proper equipment. Thanks for stopping by and good luck! Let me know if you have anymore questions!